As an art therapist, you need to juggle many different parts of your practice, including business administration, business development, client management, and professional development. Managing all of these components of your private practice requires juggling many limited resources including the most important resource of all – TIME! If tasks within your private practice aren’t managed correctly then you run the risk of making decisions impulsively and based on emotional reactions as you try and mitigate the unfolding chaos of juggling so many projects. Task management systems and software allow you to make informed decisions about ways in which to maximise your time and organise your resources for the most effective use of your time. Task management software can also be useful when collaborating with other people if you are using a tool that is available to multiple users. With the development of technology, there are now a number of task management software options available across a variety of different platforms including standalone or cloud-based software. There are also numerous options that relate to the type of device you use, whether it be PC, MAC or mobile devices. The most useful task management software will enable you to access your tasks across a variety of devices at any time so that you can create, record, and manage your tasks wherever you are at the time. Task management software varies in complexity based on the type of tasks that you need to complete. 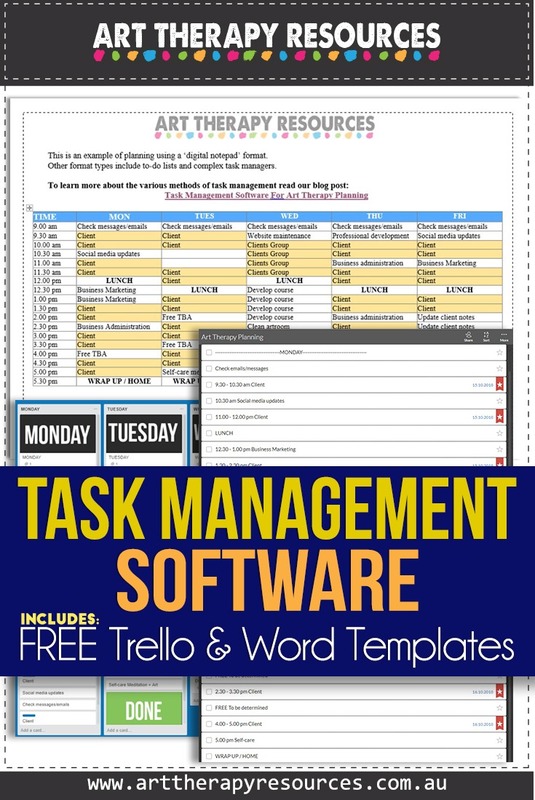 The most basic form of task management software is a digital notepad on your computer or mobile device. The next layer of complexity would be a simple to-do list application, followed by a simple task application, and then followed by a more complex task manager application. The choice of task management system should suit the requirements of your tasks and should ensure that you don’t shift your time of managing task to instead managing software. Most computers and mobile devices have an inbuilt digital notepad system that you can use to capture your tasks. These programs let you capture your tasks, however, they rely on you to sort and prioritise tasks and spend the most amount of your time manipulating the data so that you can create a final list of tasks to complete. These methods are not as portable across multiple devices and usually require that you manually save and send copies to other devices if you want to work on them at another time. They provide limited ability to sync data in real time. There is a multitude of to-do list apps that are available for computers and mobile devices that can be synced across devices so that you can work on them anywhere. These are apps are usually more automated in capturing and organising data so that you can spend more time on completing your tasks instead of managing the task management software. More complex task managers have the benefits of notepads and to-do list type programs, however, they have extra features that enable you to group tasks into projects. You can also plan your tasks more efficiently and use due dates and progress reporting where necessary. These task managers usually allow you to collaborate with other users and assign tasks if there are multiple people involved in the project. You can also include correspondence between multiple users and share documents and attachments. This means the task management software becomes a more comprehensive system to manage various aspects of a larger project or the daily activities of your private practice. Most of the above task managers are free or provided an option to pay for additional features. 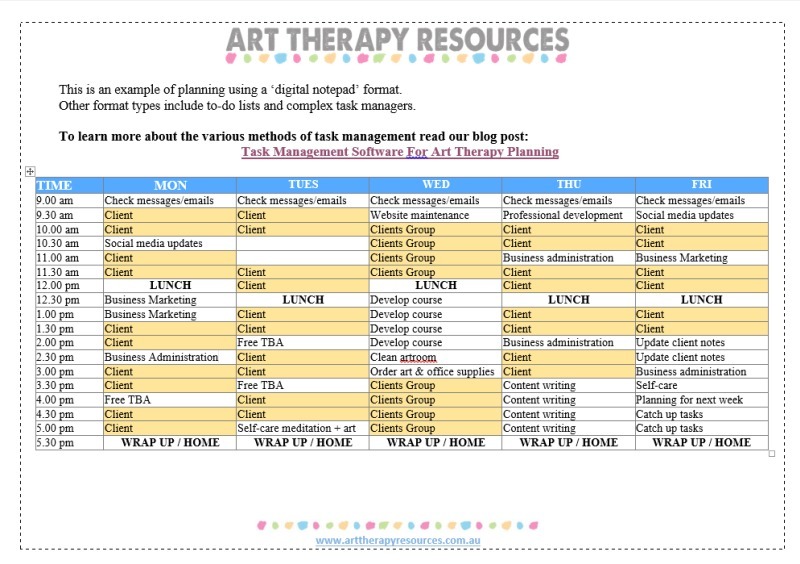 To showcase how each of the different levels of task management software can be used we’ve created an example of tasks completed over a week in a small art therapy private practice. You can download the example below using Microsoft Word by signing up below in the FREE DOWNLOAD section. All information can be changed to suit your circumstances. Use colour coding of each cell to visually remind you of important parts of your day. In this example, client work has been identified with yellow so that these hours are easily identifiable at a glance. Unfortunately Wunderlist doesn’t have a download or share feature within its software, however, you can see from the image below, how you can use Wunderlist to set up your weekly schedule. Wunderlist has a number of reminder and due date features that will provide you with the ability to identify important parts of your day. 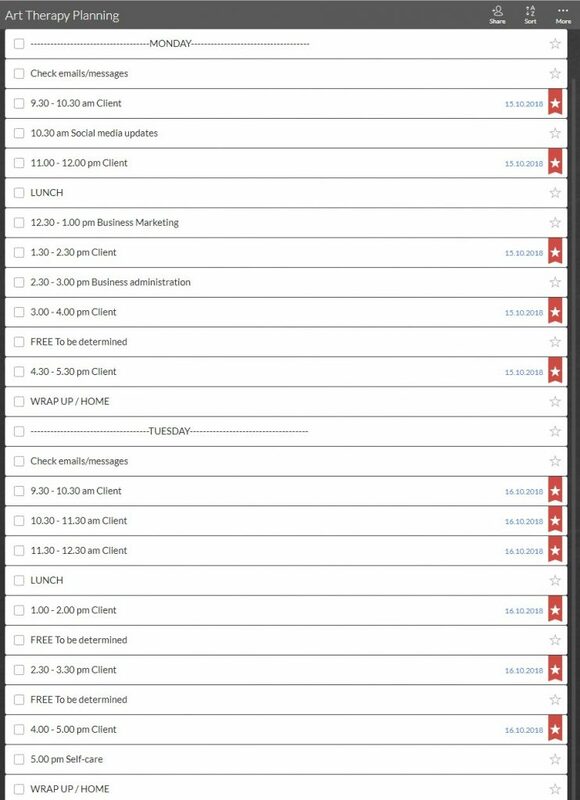 In the example below, you can see that all client work hours have been marked with a STAR and a date. The date is included with a time to remind you when client appointments occur. With Wunderlist you can easily access your list across multiple devices at any time as long as you have an internet connection. This means you can easily update your schedule as changes occur instead of having to be in the office with access to a single hard copy on your computer only. As Wunderlist is classified as cloud-based software you should ensure that you do not include any private client details. The example below is based on the FREE Weekly layout. It has been simplified to remove the DOING cards. All client activity cards have been colour labeled blue for easy identification. On Monday you can see the morning activities have been moved below the DONE card to show what items have been completed for that day. Using the Trello card system is very easy to drop and drag the cards in case of any changes. Each card has the ability to attach documents and any background information that you require to complete the task. With Trello you can easily access your board across multiple devices at any time as long as you have an internet connection. This means you can easily update your schedule as changes occur instead of having to be in the office with access to a single hard copy on your computer only. As Trello is classified as cloud-based software you should ensure that you do not include any private client details. SIGN UP below to download the FREE Microsoft Word example template to create your Art Therapy Private Practice planning calendar. 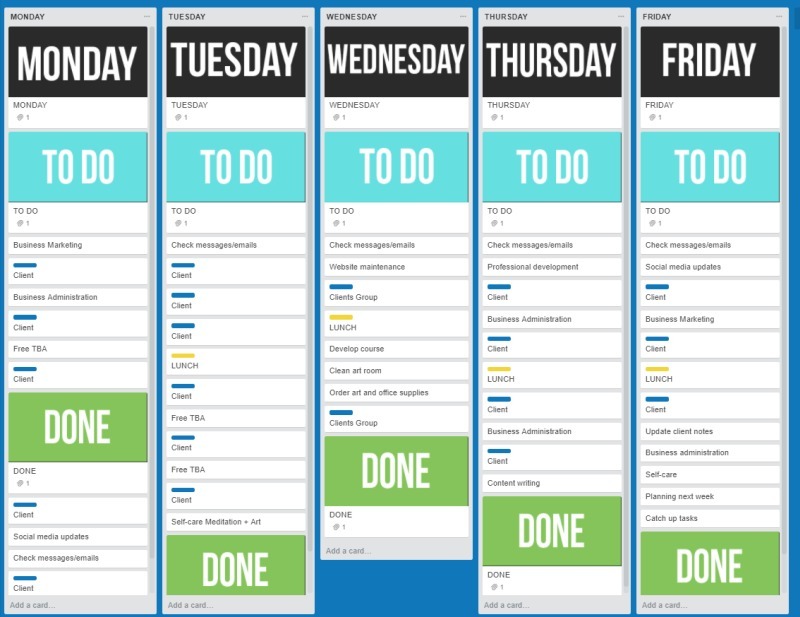 You can also download the FREE Trello board template based on a weekly layout.